Justin Plowman is the director of the horror comedy Brew of the Dead II: Oktoberflesh, currently running at UNDER St. Marks, and its predecessor, Brew of the Dead. Other directing credits include Robosaurus and Fancy Eating You Here for A Cavalcade of Curiosities and Porcelain & Pink for A Voluminous Evening of Brevity. As an actor, he recently appeared in GeminiCollisionworks's ObJects and DMTheatric's Plan 9 from Outer Space, both at The Brick, has appeared in numerous Dysfunctional shows over the last decade and also appeared in and co-produced Clue - Live on Stage playingWadsworth the Butler. Justin is Dysfunctional Theatre’s Director of Development. I recently had a chance to talk with Justin about a subject both fascinating and repulsive to me -- zombies. So are you sick of people asking you if Brew of the Dead II: Oktoberflesh is going to be like "The Walking Dead," or "Dawn of the Dead," or any of the other zombie-related shows and movies out there? Not at all. Both of our shows owe a huge debt of thanks to the "zombie lore" that came before us. 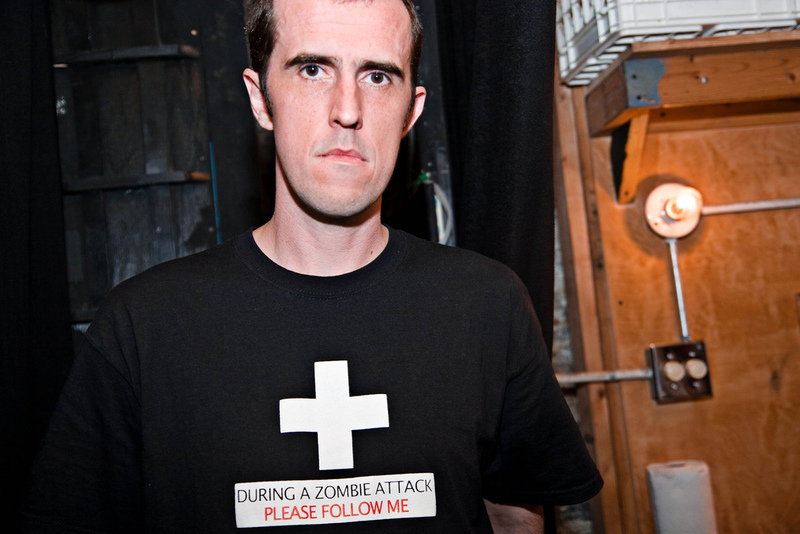 In fact, much of the humor in the plays is based on the assumption that the audience HAS seen a lot of zombie themed movies. Did your work on Brew and Brew II involve much zombie research on your part, or were you already a fan of the genre? Me: Pat, please tell me you got Piscopo in there! One of the differences between Brew and Brew II is the zombies. The original Brew didn't show a flesh eater until the very end of the play (in a wonderfully inventive ending). This one brings a zombie onstage early on. Was it a challenge to keep the zombies frightening? I liked the way we did the zombies in the first one, but we couldn't use that trick again and we knew it. We decided early on that if we were going to do a full-on sequel, then it would have to have more of everything. More blood, more action, and more of the undead wandering around. As for keeping them frightening, we wanted the early zombie to grow on the audience a bit and then have the audience turn on THEM in Act Two. Not sure that we completely succeeded there but that was the intent. By the end of the show, I feel the zombies have become a legitimate threat again and that's what matters. I loved the fact that so much of the Brew cast was back, albeit playing different characters. Since many of you have worked together before, what was the rehearsal process like? Much like the characters in both shows, we've become a sort of zombie apocalypse family. Some of us were experts while the others had to go through a "zombie boot camp" to catch up. There were a LOT of movie nights and trading of DVDs early on. Between the two shows, we actually went and filmed the first one as a feature in the woods by the Delaware Water Gap over one weekend (it was actually the weekend the Rapture was supposed to happen, which we all enjoyed immensely). So, needless to say, the rehearsal process was relatively painless. The actors knew the genre, knew their characters, it was just a question of getting the bits all smoothed out and the lines into their heads. I'm a big fan of Nosedive's Stephanie Cox-Williams, who was your "Gore Designer" for the show. How did she become involved in the production? Amy Overman (the Artistic Director of Dysfunctional) and I became quick friends with Stephanie through some mutual friends at The Brick Theater out in Brooklyn. She's amazing. As soon as we pitched the idea to her, she immediately said yes and it's been all blood soaked fun and games since. She really helped us up the ante with the sequel and we were extraordinarily lucky to have her. Your pre-show and intermission video segments were great, and I remember seeing some of the "who will survive the zombie apocalypse" videos used as publicity in the previous Brew of the Dead. Who put all that together? That was me and Amy running around NYC with a camera. The PSA's are all still available on Dysfunctional Theatre Company's YouTube channel. We filmed them as a goof. As a way to get a lot of friends of ours involved in the show since they couldn't be onstage. But as we were doing them, we started to realize they were a really funny way to get the audience into the right state of mind so we decided to use them. Throw in some Iron Maiden and GWAR between them and you got yourself a pre-show! As for intermission, we needed to show the passage of time and give the actors a bit of a break since they're almost all onstage the entire time so I figured, let's just address that directly to the audience. It's a zombie show. We're not out to prove any great truths of the universe or show some existential flaw in existence. Let's just have some fun and hit each other with crowbars. There were some great moments of shock and suspense (which I, of course, don't want to give away), that I think were really aided by the fact that UNDER St. Marks is such an intimate theatre. On the flip side, the audience is probably never more than 20 feet from the actors, so sometimes they can see... well, how the magic works, so to speak. What were the pros and cons of the space for you? Well, once again, it IS a zombie show. We're hoping that seeing "the magic" won't affect anything because how often do you see crowbars shoved into eyeballs with blood splattering everywhere? UNDER St. Marks has been a great home for the two shows because it's kinda creepy on its own. After walking down the dark stairwell you see lines of seats and one entire wall of exposed, broken brick. Really helps set the mood. As for cons, there's always problems sharing a space with other groups. Whether it's having to clean up all our mess and be out in 10 minutes, or having 2 lights just not work at all because some young company didn't understand how to set it properly. You never know what you're walking into with a shared space but Horse Trade has been great at solving any problems that may arise. The zombie apocalypse starts tomorrow (well, let's say Saturday, after the final performance), and the cast and crew is trapped in the theatre, surrounded by hungry, East Village zombies. Which one will survive? Are you kidding? We are fully stocked with weaponry (although the guns are fake SPOILER) and have an entire fridge out back filled with beer. We hole up there and get access to the building above. We'll figure it out from there. And, come on, East Village hipster zombies? What, are they going to try and bite me "ironically"? What is your own personal zombie survival plan? Shaun had it right. Find a weapon. Find some friends. Find a bar. Hole up and watch the news until a better plan presents itself or you join the French Foreign Army of Darkness. Who survives the zombie apocalypse: George Romero, Robert Kirkman or Max Brooks? Kirkman takes the most realistic look at the whole thing so probably him. Max Brooks can just stay with his dad and hope Zero Mostel doesn't zombie up and take revenge for Mel ruining "The Producers" movie. As for Romero.... it pains me to say this.... it's over Johnny. While he started the whole genre he simply doesn't understand it anymore. He wouldn't last 10 seconds. And really, that might benefit the rest of us. I mean, did you SEE "Diary of the Dead"? OR "Survival of the Dead?" Scary. And not for the right reasons. Tickets ($18/$15 students & seniors) are available online at http://www.horsetrade.info/ or by calling Smarttix at 212-868-4444.